(Nanowerk News) Scientists from the RIKEN Advanced Science Institute in Wako, the University of Tokyo and Sungkyunkwan University in Korea have developed a quantum theory that explains how temperature and quantum fluctuations—a direct consequence of the Heisenberg uncertainty principle—affect the properties of materials called multiferroics (Quantum Theory of Multiferroic Helimagnets: Collinear and Helical Phases). 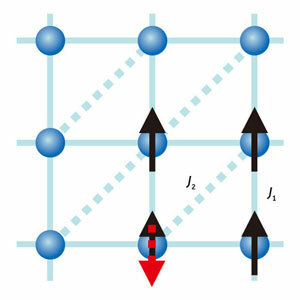 In a magnet, interactions between the ‘spins’ on neighboring atoms result in the spins lining up collectively; in a ferroelectric material, the crystal lattice distorts so that positive ions move away from negative ions. In a multiferroic material, electric polarization and magnetism are linked, which is particularly attractive for use in technological applications such as high-density data storage. Quite a few multiferroic materials have been identified to date. Theory has played an important role in the search for new examples by predicting which types of crystal structures allow both ferroelectricity and magnetism. In earlier work, Hosho Katsura and Naoto Nagaosa, two of the authors of the new paper, showed that an electric polarization can occur in magnets called ‘frustrated magnets’ (Spin current and magnetoelectric effect in noncollinear magnets), which now provides a unified view on many of the multiferroic materials. The source of ‘frustration’ in a magnet. A magnetic ‘spin’ (black arrow) sits on each point of the square lattice. The interaction between spins along the edge of the squares (denoted by J1) tends to make the spins line up parallel to each other, but the interaction along the diagonal (denoted by J2) tends to reverse the direction (red arrow). To accommodate these competing interactions, the spins form a spiral. In frustrated magnets, the spin of an atom lacks a ‘preferred’ direction along which to point because of competing interactions with its neighbors. Frustration can occur on a square lattice, for example, when the interaction between spins along the square edges tends to make the spins parallel, while an antiparallel interaction occurs along the diagonal. As a compromise between these two interactions, the spins form a spiral arrangement—that is, the direction of the spin rotates from site to site on the lattice. This spiraling structure gives rise to ferroelectricity. To accurately describe ferroelectric spiral magnets, which include the materials Ni3V2O8, LiCuVO4 and LiCu2O2, Katsura, Nagaosa and their colleagues needed to account for the effects of temperature and quantum fluctuations in an all-encompassing theory. To do this, they used what is called the ‘Schwinger boson’ approach, which allows them to describe each spin with both a classical and a quantum part. Temperature and quantum fluctuations are known to disrupt magnetic order, in frustrated magnets. “Quantum fluctuations introduce new magnetic phases that are not predicted classically without magnetic anisotropy, such as a ‘collinear’ phase in which the spins are aligned in the same direction but have different lengths,” says Katsura. As the predictions of the theory differ to those of the purely classical theory, they have important implications for interpreting experiments on particular materials, including LiCu2O2.